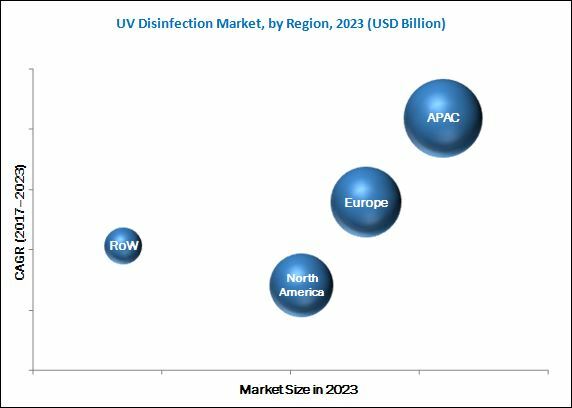 [152 Pages Report] The UV disinfection market was valued at USD 1.72 Billion in 2016 and is expected to reach USD 4.27 Billion by 2023, at a CAGR of 13.67% between 2017 and 2023. This report provides the market size and future growth potential of the UV disinfection market across different segments such as component, application, end user, and geography. The study identifies and analyzes the market dynamics such as drivers, restraints, opportunities, and challenges in the UV disinfection market. Moreover, this report profiles the key players operating in the UV disinfection market. The growth of the UV disinfection market is driven by factors such as growing need for safe drinking water in developing countries, increasing favorable government initiatives, rising awareness among the users and need for eco-friendly disinfection system. The base year considered for the study is 2016, and the market size forecast is provided for the period between 2017 and 2023. The research methodology used to estimate and forecast the UV disinfection market begins with capturing data on key vendor revenues through secondary research. The vendor offerings have also been taken into consideration to determine the market segmentation. The top-down procedure has been employed to arrive at the overall market size of the global UV disinfection market from the average number of UV disinfection equipment units sold worldwide and the average price of UV disinfection equipment in USD. After arriving at the overall market size, the total market has been split into several segments and subsegments, which are then verified through primary research by conducting extensive interviews with key people such as CEOs, VPs, directors, and executives. This data triangulation and market breakdown procedures have been employed to complete the overall market engineering process and arrive at the exact statistics for all segments and subsegments. This report provides valuable insights regarding the phases in the ecosystem of the UV disinfection market such as research, design and development, manufacturers and integrators, transmission and distribution, post-sales services, prototype, software development, process development, component manufacturer, hardware development, system integrators training and consulting, process regulatory approval, communication networks and end users such as utilities and industrial. This study also answers several questions for the stakeholders such as the market segments to focus on in the next two to five years for prioritizing their efforts and investments. Some of the key players operating in this market are Xylem (US), Trojan Technologies (Canada), Halma (UK), Calgon (US), and Atlantic Ultraviolet (US), Australian Ultra Violet services (Australia), UV Pure (Canada), LIT Company (Germany), ozonia (Switzerland), and uv-technik (UK). This research report categorizes the global UV disinfection market on the basis of component, application, end user, and geography. Detailed analysis of various application and end user for each country. According to MarketsandMarkets’ forecast, the UV disinfection market, in terms of value, is expected to grow from USD 1.98 Billion in 2017 to USD 4.27 Billion by 2023, at a CAGR of 13.67% between 2017 and 2023. The major drivers for the market include stringent government regulations pertaining to UV disinfection, increase in preference among end users toward technologically advanced disinfection solution, and environmentally friendly composition of UV systems. This report covers the UV disinfection market on the basis of component, application, end user, and geography. The municipal segment is expected to hold the largest share of the market between 2017 and 2023. The UV disinfection market for the water and wastewater application is expected to grow at the highest CAGR during the forecast period. The increasing need for safe drinking water and wastewater treatment in the industrial segment drives the growth of the UV disinfection market for the water and wastewater application. 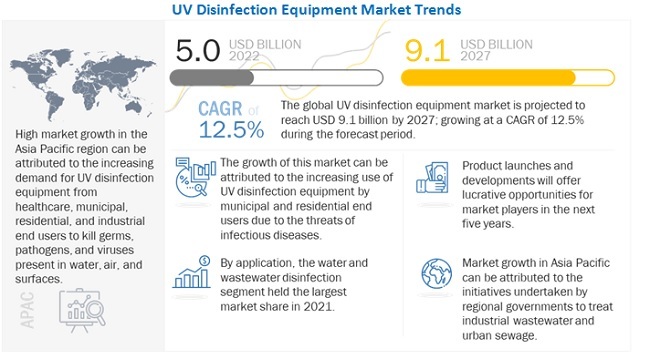 Stringent government regulations in countries such as the US, the UK, Germany, Singapore, and India toward proper disposal of wastewater from industries is also driving the growth of the UV disinfection market for the water and wastewater application across the world. The UV disinfection market for the municipal segment is expected to grow at the highest CAGR during the forecast period. The highest growth rate of the municipal segment can be attributed to the increasing demand to treat wastewater and water available in natural resources. Projects such as River Ganga, Five Year Plan of China Government, and Chicago River project are involved in the installation of the UV disinfection equipment. These planned projects to disinfect water and wastewater is expected to drive the municipal segment market at the highest rate between 2017 and 2023. APAC held the largest share of the UV disinfection market in 2016. The UV disinfection market in APAC is expected to grow at the highest CAGR between 2017 and 2023. The increasing demand for UV disinfection among residential, commercial, municipal, and industrial end users is the key driving factor for the high growth of UV disinfection market in this region. Governments in this region are paying more attention toward treatment of wastewater as countries, such as Singapore, Vietnam, and India, are facing scarcity of safe drinking water. For instance, in Hong Kong, the Drainage Services Department installed two-photon medium pressure UV systems manufactured by Hanovia to meet the stringent requirements of the discharged effluent. The major challenge for the companies in the market is the lack of awareness among end users regarding the benefits of UV disinfection technology over other disinfection technologies available in the market. The major vendors in the UV disinfection market include Xylem (US), Trojan Technologies (Canada), Halma (UK), Calgon (US), and Atlantic Ultraviolet (US), Australian Ultra Violet services (Australia), UV Pure (Canada), LIT Company (Germany), ozonia (Switzerland), and uv-technik (UK). These players adopted various strategies such as product developments, mergers, partnerships, collaborations, and expansions to cater to the needs of their customers. *Details on Overview, Products Offered, Strength of Product Portfolio, Business Strategy Excellence, Recent Developments, Key Relationships Might Not Be Captured in Case of Unlisted Companies.